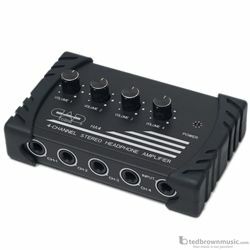 The HA4 is a compact stereo headphone amplifi er featuring four discrete channels with individual volume controls. Exceptional signal-to-noise ratio ensures optimum clarity and offers a transparent reproduction of your session. The HA4 is an essential tool for enhanced listening performance and a vital accessory for the recording musician.